IBB: Hi, Megan. Welcome to the Book Butler Lounge. Can you tell us a little about yourself and your work? MC: My name is Megan Cashman. I was born and raised on Staten Island, NY and now I live in Brooklyn, like so many other writers. I like to write about possibilities, asking big questions and even minor questions, while also going on a journey to other worlds or even in the minds of my characters. “The Dark Proposal” is my first book. IBB: You’ve got twenty words to sell us on your work. Tempt us. 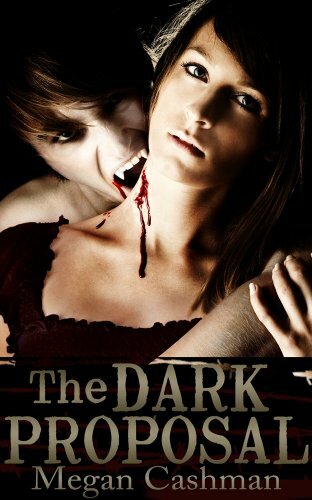 MC: “The Dark Proposal” is the anti-Twilight, with vampirism returning to its menacing roots, with little room to love humans. MC: I would say writing is harder than most people think or believe. It takes a lot of work, dedication and focus. As for self-publishing, I’d say like many authors, I had to learn about the business aspect of selling books all on my own. It was a trial and error thing for me, and I’m still a novice. MC: I prefer coffee shops. Luckily, Brooklyn is full of them, LOL! It helps me focus on my work because at home, I am too distracted. At the same time, having to go to a coffee shop, find a place a sit and plug in my laptop enforces the focus and dedication needed to write. After all, if I went this far to find a place to sit at a coffee shop, I better do a lot of writing! MC: As a person, it is hard to say because my tastes have been fluctuating in recent years. But as an author, I would say books by Anne Rice influenced my writing style and storytelling skills. I could also say books that I read as a young adolescent still have a hold on my writing. MC: Life. In my experience, it isn’t easy to come up with ideas for stories, characters and scenes without going through a lot. MC: I want people to think and be challenged on how they see the world. I want them to ask and explore the questions that I am offering to them. I also hope to take my readers into various worlds, no matter what kind. MC: I am constantly editing my work. No writer is ever satisfied with their work, and no one’s work is ever done. IBB: What is the ideal relationship between editor and author? MC: A good editor is someone who understands the goal of the writer, while a good author is someone who understands that the editor is like the wise owl who sees all and can know what is best for the author. MC: Thank you for reading my work! IBB: What does your writing future hold for you? MC: More books, hopefully, a few screenplays, plays, and if I’m super lucky, a web series! IBB: How have you set about the task of creating enticing cover art? MC: I keep it simple while looking through stock photos, waiting for the right one to jump out at me. Simplicity while enticing works. Meaning, don’t overdo it. A few images can say a lot about a book. MC: I go back and forth between fiction and nonfiction. For nonfiction, I like to read history, current events, spirituality. For fiction, I like to read historical novels, though lately, I’m showing more interest in thrillers and mysteries. Megan’s latest release, The Dark Proposal, can be found right here.